I used 100% beef, avocado, and cheese, but the filling can be your choice!!! 1. Put ground beef, salt, pepper, and nutmeg in a bowl, and mix well by hand until all ingredients are combined and smooth. Divide it into half, then form each into flat and round shape, little bit larger than the hamburger buns (because they shrink when they are cooked). In a frying pan or on a BBQ grill, cook the hamburger steaks and sliced onions to desired doneness. 2. Slice the hamburger buns and toast them in a frying pan or a BBQ grill. Place lettuce, sliced tomato, hamburger steak, sliced cheddar cheese, sliced onion, and avocado between the hamburger buns. 3. 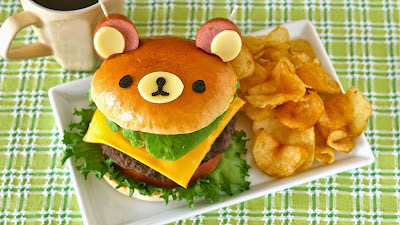 Make Rilakkuma's ears with boiled sausage and sliced cheese, then attach them with toothpicks. Make eyes, nose, and mouth with sliced cheese and Nori sheet. It is slightly salty, so it is up to you to eat with ketchup!